RBTH presents a selection of views from leading Russian media on international events, featuring reports on the parliamentary elections in Finland, a diplomatic slap on the wrists for Russia from Norway over an unsanctioned visit to its Arctic territory, and the beginning of Ukrainian-American military exercises in Western Ukraine. The centrist newspaper Nezavisimaya Gazeta reviews the recent parliamentary elections in Finland. The newspaper explains the defeat of the pro-European and pro-NATO coalition and the opposition’s rise to power by citing the public's reaction to the poor economic situation, caused, among other things, by the sanctions regime in place between the EU and Russia. According to the polls, the leader of the opposition Center Party of Finland, Juha Sipilä, is set to become the next prime minister. The coalition led by current Prime Minister Alexander Stubb had record low popularity rates ahead of the elections due to his zealous support for the aspirations of German Chancellor Angela Merkel to strengthen the unity of the EU in its sanctions policy, Nezavisimaya Gazeta explains. According to the newspaper, Sipilä sees sanctions against Russian as inevitable and supports them, but believes that the negative effects of the sanctions regime on the Finnish economy are being underestimated. 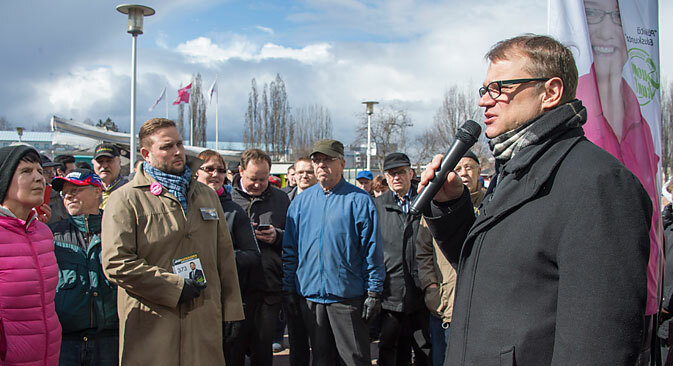 Sipilä has called for the sanctions regime to be scrutinized and the European Commission to recompense losses to Finnish manufacturers. He advocates good relations with Moscow, which are necessary for normal trade exchanges. The experts interviewed by the newspaper believe that the new government in Helsinki will defend the interests of Finnish farmers and normalize relations with Moscow. According to Johan Bäckman, a political activist and legal sociologist and University of Helsinki docent, a certain turnaround is to be expected in Finnish foreign policy, and relations with Russia should normalize. According to Bäckman, the appointment of Paula Lehtomäki, a representative of the Center Party and the chairwoman of the Finland-Russia friendship society, as the foreign minister in the new cabinet would be optimal for communication between the two countries, writes Nezavisimaya Gazeta. Norway has officially protested against the visit of Deputy Prime Minister Dmitry Rogozin, who is on the Western sanctions list, to the island of Spitsbergen in Norway’s Arctic archipelago of Svalbard, the online newspaper Gazeta.ru reports. The diplomatic incident reveals a new round of struggle for the Arctic, which can only escalate in the near future, writes the newspaper. According to Gazeta.ru, Russia and Norway are members of the Arctic Council, which also includes Iceland, Canada, Norway, the U.S., Sweden and Finland. A ministerial meeting of these states is due to be held in the Canadian town of Iqaluit later this week, the website reminds. The chairmanship of the Arctic Council is to pass this week to the United States for two years, which – as Pavel Gudev, senior researcher of the Institute of World Economy and International Relations at the Russian Academy of Sciences, notes – may lead to "contradictions" in the work of the council. The point, said Gudev, is that the country has "a very limited presence in the Arctic." "The U.S. has always sought to 'dilute' the weight of Russia and Canada as the largest Arctic players by increasing the role of the other permanent members of the council," said Gudev. The Arctic issues must be addressed by tripartite talks between Canada, Denmark and Russia, but "it is a big problem under the pressure of the sanctions," Gudev told Gazeta.ru. The Ukrainian-American command post exercise, Fearless Guardian 2015, has begun in the Lvov Region of Western Ukraine, the business daily Kommersant reports. Declaring the exercise as proof of the solidarity between Washington with Kiev, Ukrainian President Petro Poroshenko welcomed the U.S. military onto Ukrainian soil. Poroshenko described relations between Kiev and Washington as "a strategic partnership, which is being carried out at different levels" – "from the president to soldiers," writes the newspaper. The newspaper reminds its readers that the agreement to hold the exercises was reached between Ukrainian President Petro Poroshenko and U.S. Vice President Joseph Biden. According to official reports, 300 paratroopers of the 173rd Brigade of the U.S. Army have arrived in Lvov for the training of the Ukrainian military for combat operations. Overall, about 900 fighters of the National Guard will take part in the exercise, writes Kommersant.